Lately, I have been looking to combine multiple internet connection to make a single high speed connection, I spent countless hours finding ways to merge my backup internet connection so I can utilize maximum speed but I could not find any reliable solution except a few. Therefore, I created this guide to help out people who are trying to get good internet speed by combining their 3G/4G or different ISPs. Before starting, I give you an overview of how multiple combination works. There are software/hardware out there that can do load leveling between multiple internet (WAN) connections. They can tell computer to use multiple connections (IP addresses) to obtain data from a single source. Strictly speaking it does not combine the bandwidth, it just tricks the computer to use both connections to send/receive packets from multiple connections. This method works ideally with Torrent downloads, Internet Download Manager and Web browsing and gives a significant speed boost. However, other type of connections such as VPN or Proxy might not work correctly with it. TP-Link provides an efficient and economical hardware based load balancing solution. Their TL-R480T+ Router can combine upto 4 WAN connections (PPPoE, PPTP, L2TP, Dynamic IP) into 1 LAN connection which you can later share it through WiFi Routers, LAN network hubs or directly connect it to your PC. This router is available in market for about $50 bucks, you don't need to be a network engineer to set it up, just plug your WAN cables into the WAN port(s), run the quick setup wizard and you are good to go! Prepare/configure your WAN connection first. 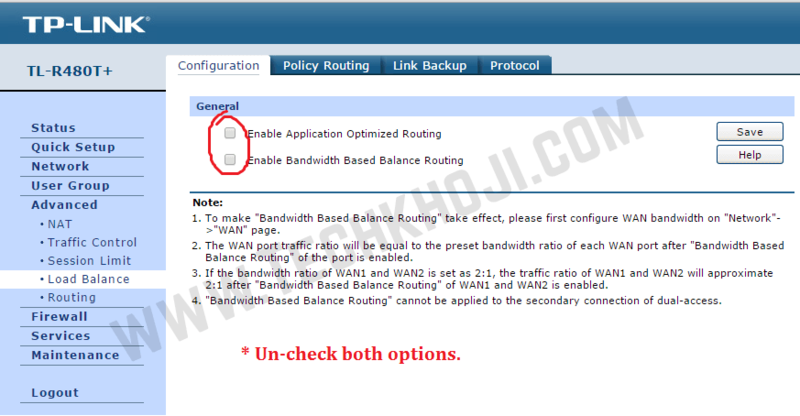 If you are connecting a LAN cable directly from your previously configured broadband router to your Load balancing router then select Dynamic IP. It will automatically acquire settings through DHCP. If you are directly connecting WAN connections such as PPTP, then you need to do settings accordingly. Un-check both "Application Optimized Routing" and "Balanced Based Bandwidth Routing". Otherwise you won't get combined download speeds. Make sure you set proper MTU (the default is 1500, for some it is 1420, it varies) for all WAN connections, if you don't, then some websites will not open and give connection timeout error. The default IP address of Router is 192.168.0.1 – Do not change it. Also keep in mind that your incoming WAN connections default gateway must be not same as the load-balancing router. If WAN connection conflicts with router, it will be stuck at "Connecting…" on Router Status page. If you connect 2 internet connection to Windows at a time, the operating system automatically selects one connection as primary and uses others as as failover connection mode. You can force Windows 7, 8 to use both connections simultaneously using a simple trick. Go to properties of any of your active Internet connection whether it be LAN, WiFi or 3G/4G. Select Internet Protocol TCP/IP Version 4, Open its properties, then go to advanced. Uncheck the Automatic Metric and type "15". Repeat same steps on other Internet connections you want to combine. There are several programs available such as Connectify Dispatch Hotspot, Speedify etc. They perform the same function as the method #2 but they have ability to create hotspot using your newly combined connections. I discourage use of 3rd party software based load balancing because it uses a lot of resources and connection quality is not reliable moreover, the app is very expensive once the trial version is expired. The above mentioned method for combining connection only works with applications that support multiple connections. Combining internet connection speed does not improve PING/Latency, online gaming will be the same. Sorry folks. Logging-in your account using multiple connections can put you under suspicion as it uses multiple IP addresses to send same data packets. Thanks for reading, if you find any mistakes or you have any improvement tips, please do share! © 2015 TechKhoji. All rights reserved.